by wangdu on October 7, 2012 in Rigul Trust. We wish to share with you the good news of how Rigul Trust and it’s dharma network was able to help and be part of this very auspicious Kagyu Ngagzod Chenmo Kawang (Empowerment) in Sikkim. On Friday, the fifth of October, Ringu Tulku made an offering in the name of Rigul Trust to provide all the food and drink for one day for about a thousand people at this very auspicious empowerment by His Eminence the 12th Goshri Gyaltsab Rinpoche. This money offered was by private sponsors who specifically contribute to a special designated dharma celebration events fund that is entirely separate from donations and sales given for our humanitarian health, education and poverty relief work. by wangdu on December 27, 2011 in Rigul Trust. Thank you so much for all your donations, service, advice and help throughout 2011. 40,000 hot meals for sixty children at Rigul school for one year funded by Rigul Trust. 10,000 patients, approximately, have received health care, with Rigul Trust funding the advanced running costs of the health clinic, the salaries of Dr. Chuga, Ani Choden the nurse and Karma Tsisha, the doctor’s assistant, at Rigul Health clinic, Tibet. 5 teachers and 3 cooks in Rigul have received salaries funded by Rigul Trust. Sikkim earthquake victims receiving appropriate help through everyone’s generosity through Rigul Trust. a commentary by Ringu Tulku. This is a Rigul Trust publication which will see 100% of the money that people have given for this book going to Ringu Tulku’s monastery, and the health clinic and school in Rigul, Tibet. We thank everyone who has worked tirelessly for Rigul Trust and volunteered to sponsor 100% of all expenses, including the production of the Chenrezig book. The three of us trustees have promised Rinpoche to do our best and continue raising awareness and funds for the health clinic, Doctor, nurse, assistant, 60 school children, 5 teachers, 3 cooks and the Khenpo’s salary in Rigul – for this, approximately £25,000 or 28,000 euros will be needed for 2012 for very, very basic poverty relief. This is not allowing for repairs, maintenance, perceived needs or urgent requests and ever rising costs of raw materials in China. We look forward to working together in 2012 and welcome you to join with us and help Ringu Tulku Rinpoche with his health, education and poverty relief projects in his birthplace of Rigul, Kham, Tibet. Rinpoche is the abott of Rigul monastery. by wangdu on December 3, 2011 in Rigul Trust. We would like to thank everyone for their generosity in giving to the Sikkim Earthquake Relief Fund. The finer details of the distribution of this fund is work in progress with Ringu Tulku Rinpoche working on this in Sikkim at the moment. The roads in Northern Sikkim are not yet open. Rinpoche travelling to Jakarta and Singapore. In Singapore, Rinpoche will be giving a teaching on Chenrezig. It is with great joy that we have managed to ship copies of the Chenrezig book, by Ringu Tulku, to Singapore costing ‘an arm and a leg’ (ie. very expensive!). This is a service to the Dharma and Dharma is paramount in this situation. Pat Murphy is receiving these and will be an ambassador for Rigul Trust for raising awareness and funds for Ringu Tulku’s homeland, his monastery, the health clinic and school in Rigul, Tibet. by wangdu on October 30, 2011 in Rigul Trust. We are pleased to share with you the news about Rigul, Tibet and the ways that your very generous donations are giving on going support to some of the survivors of the 2010 earthquake in Yushu. This money is from the special appeal that we had for the earthquake last year – a designated fund. Please don’t miss clicking on the Rigul Trust video clip with Ringu Tulku talking about Rigul, Tibet and Rigul Trust in the Newsletter. by wangdu on September 24, 2011 in News, Rigul Trust. A devastating EARTHQUAKE of 6.9 in Sikkim and parts of northern India last week has been followed by 50 further after-shocks of up to 3.9 and has caused terrible destruction to buildings, loss of life and injuries, and closed roads challenge rescue efforts. The death toll is now 130 people but many more bodies are trapped in the rubble of buildings. The remoteness of much of this underdeveloped mountainous region and road closures from land slips has made it a very difficult task to get any help to the region and 9 villages are still completely cut off. With rescue teams facing difficulties to reach some far-flung quake-hit areas in Sikkim, hundreds of survivors are trekking out of their cut-off villages, crawling sometimes to negotiate dangerous stretches where landslides and heavy rain have loosened huge boulders which have come down the mountainsides. Entire areas are cut off because of landslides – and more often than not people are without clean water, adequate food supplies, medicine and telephone contact with the outside world. Sikkim’s hospitals have seldom been so full. We, at Rigul Trust, have offered Rinpoche help with setting up an appeal for the earthquake in Sikkim. Rinpoche wishes this to be called the Sikkim Earthquake Relief Work Appeal. In the last two years we have set up two emergency appeals, one for the survivors of the Yushu earthquake 2010 and one for the Ladakh flood disaster last year where we supported the relief work that Khenpo Rangdol, Principal of Kagyu College, Dehradun was in charge of. 100% of all donations went to these projects. We also helped fund emergency relief work in Yushu province of Tibet and now we have an ongoing sponsorship programme for 14 little children who were orphaned as a result of Yushu earthquake. We sent money for the buying and distribution of barley. And in Ladakh we sent money for emergency relief and the reforestation of trees. 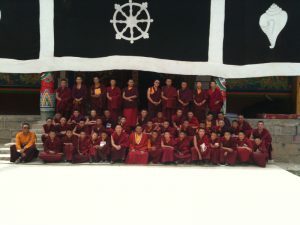 Khenpo Rangdol went to Ladakh, oversaw the projects and distributed the money. This is background information for you to know that all of what we do is overseen by Rinpoche, 100% of your donations gets to the targeted projects. We are extremely careful with whom we deal with and Rinpoche always has the last say. 100% of all donations sent through this secure PayPal site will go to the Sikkim Earthquake Relief Work. PayPal accepts all currencies. Maybe this is the time to help. There are lots of destruction. Even Rumtek Shedra’s new building is badly cracked. There was one earthquake last night and one today afternoon and destroyed at least one building in Gangtok. Lots of schools are destroyed fully. Many monasteries are also badly damaged. We do not get any news from tv and radio any more. Rain is still pouring. Celebration of Rigul Trust’s 3rd Anniversary. by wangdu on May 15, 2011 in Rigul Trust. We are joyfully celebrating three years of Rigul Trust with suggestions for beautiful offerings that will accumulate merit in order to bring great benefit to the welfare of all beings. by wangdu on November 29, 2010 in Rigul Trust. We bring you our latest news and some wonderful photos of Rigul, Kham, Tibet. Please click here to download our latest Newsletter. Francois took these amazing photos when he visited Rigul again this summer on a family trip with his two daughters. by wangdu on September 6, 2010 in Rigul Trust. by wangdu on August 19, 2010 in Rigul Trust. Principal of Kagyu College, Dehradun, India. I hope you are doing well. I am not very happy to share this news there was flood disaster happened in Ladakh everywhere. I hope you are aware that hundreds of people lost their precious lives and belongings and hundreds of people lost their home. by wangdu on August 9, 2010 in Rigul Shedra, Rigul Trust. Francois is currently visiting Rigul and the different projects Rinpoche has there. Today he visited the brand new shedra that was built thanks to the generosity of Chinese sponsors. Khenpo Zopa from Kirti monastry in Amdo is teaching 49 monks coming from Rigul monastery but also other monasteries from the area.